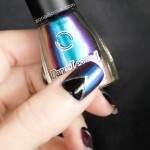 These summer nails are truly magical! They look beautiful and take only 10 minutes to do! Say what? Yes, 10 minutes or maybe even less! 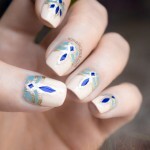 The secret is that I used one of the new SoNailicious stickers to create this blue and gold nail design. 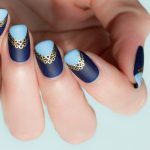 With intricate gold details shining against the calm matte blue, this manicures looks beautiful and is perfect for summer. 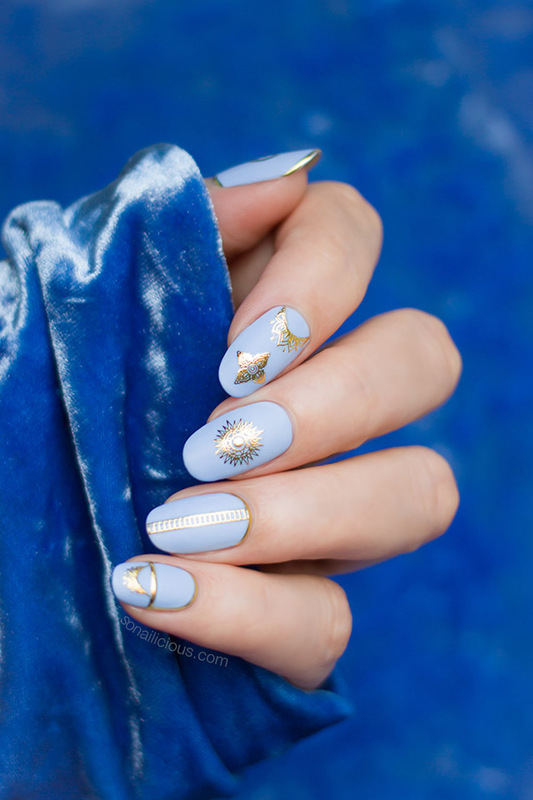 To get the look: simply apply gold Celestial stickers (new style) over blue matte polish (Dance Legend Periwinkle), then add a layer of a matte top coat to secure it all. That’s it! 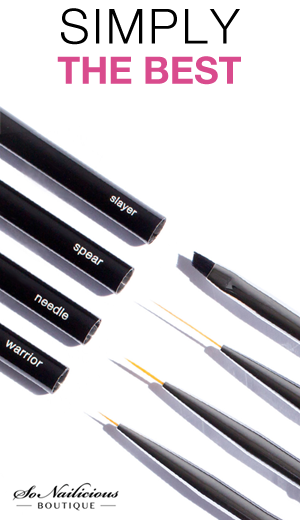 No smudged lines, no stamping, no mess, hassle… 10 minutes and you’re done! 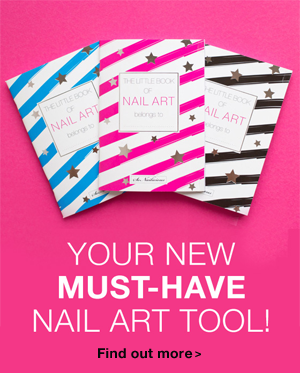 Just what you need to speed up your summer nail art. The new ‘Golden Summer’ SoNailicious nail sticker collection, including the featured Celestial stickers and more new gorgeous styles, is launching this Wednesday, on 06/06/2018. 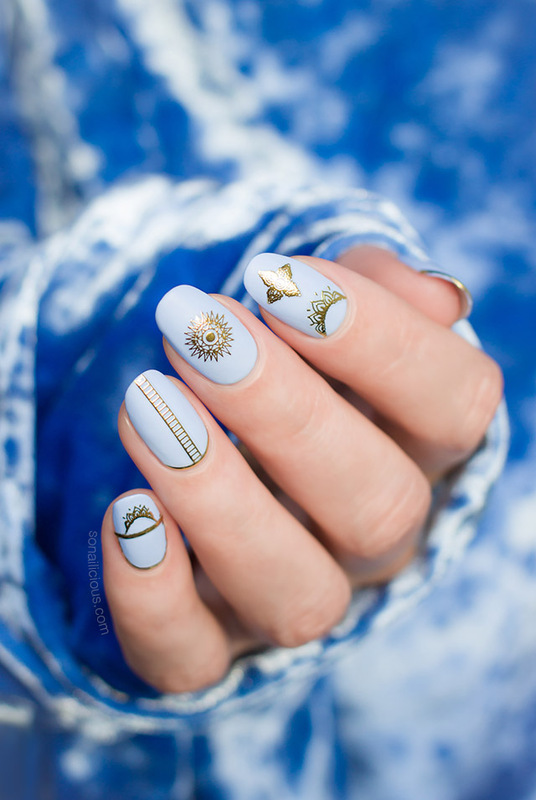 The new Summer stickers will make your summer manicures easy and pleasant like a sea breeze. As you see from the photos, these nail stickers are literally undetectable on nails. So no one will ever guess it how you’ve created such a beautiful, flawless manicure yourself unless you tell them… But let’s keep this secret between us, nail art warriors! I can’t wait to show you the entire new ‘Golden Summer’ collection and hear what you think of it. So make sure to come back on SoNailicious.com this Wednesday, 06/06/2018, to be the first to see and shop the new range! UPDATE: the collection is now available! See and shop all the new nail sticker styles here. How do you like the idea of simplifying your summer manicures? And the main question, are you excited to see the new ‘Golden Summer’ collection? Only 2 more days till it’s revealed! P.S. Make sure to come back on SoNailicious.com this Wednesday, 06/06/2018, to be the first to see and shop the new range! There will be some awesome surprises during the launch too ;) So mark that date in your calendar, trust me you don’t want to miss it.